This past Sunday the sun broke the weekend storm just for L.A. Loves Alex’s Lemonade charity food fest. At least it seemed like it. Since the rain stopped and the clouds cleared in time for the early afternoon Culver City fundraiser. But the organizers were prepared just in case, erecting tents to shield the vendors from StormWatch 2011, Part 3. Fortunately, by the time the masses were let in, the skies were blue and the sun was shining brightly so the tents effectively provided shade for grazing attendees. However, many didn’t plan for the muddy lawn, and ended up ruining their Gucci ballet flats. Ah well. #Firstworldproblems. 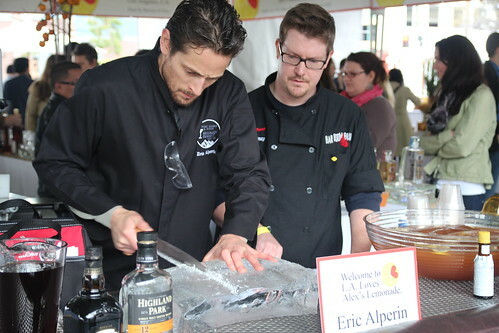 Mixologist Eric Alperin carving his own ice. Fortunately, I wore my galoshes so my only real concerns were “Which bite to try next?”, “Is 11:30 too soon to already be drunk”? and “When is Eric Alperin going to fire up the chainsaw and cut up more ice?” Like last year’s Alex’s Lemonade event, this one was easy to maneuver and there were never any long waits for food or drink. Amazing considering this year was buzzing with over 1,000 guests. Food highlights of the day were the clam chowder and clam fritter from Providence, the smoked boudin by Stephen Stryjewski of New Orleans’ Cochon, Esquire Magazine‘s best new restaurant 2011 Sotto‘s crisp pork belly porcetto with myrtle quince mostarda, Compartes‘ peanut butter honey chocolate and the entire Huckleberry table of treats. Mmm, Valrhona chocolate chip cookies. People were going crazy for Animal‘s grilled quail with plum char sui; LAist’s Lindsay said it was so good it’s criminal. I, on the other hand, still can’t eat something that looks like how it was when it was alive. Shudder! Drink highlights were the potent and sweet “Berlin in the ’70s” cocktail punch by Neal Bodenheimer of Cure made with mezcal, tequila, orange, lemon and cinnamon; Firestone Walker’s Walker’s Reserve Porter; the Gioia “breakfast” cocktail (Bluecoat gin, Green Chartreuse, rosemary and lime) by a Marc Vetri bartender; and Craftsman‘s new Angeleno Weiss beer which was perfect for a sunny day. I would have certainly drank more but the fact that I was already drunk before noon kinda scared me. 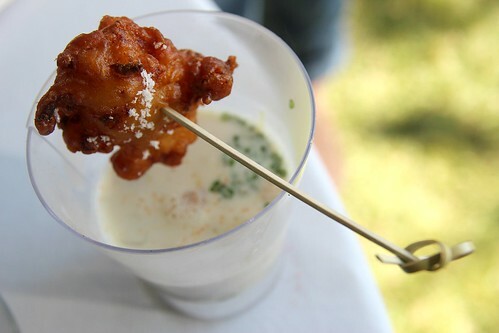 My fave food fest bite: Providence's clam chowder with clam fritter. Suffice it to say, the only thing markedly absent from the event was coffee. A surprise considering the ever-growing popularity of java. Handsome Roaster and Intelligentsia, you were missed! There were sightings of honorary celebrity host Neal Patrick Harris as well as emcee Jimmy Kimmel but no amount of liquid courage could get me or my friends to go up to them to ask to take a picture. But the event was a great success not only for the guests who were treated to some of the best food and drink around but for the event’s organizers who raised $400,000 for the charity, that’s $100K more than last year! Almost half of the money came from the auction where winning bids were $11,000 for the Sine Qua Non Dinner with Jar, Animal and Sotto; $61K for the Great Women Chefs Dinner; and a $20K Tokyo package on Singapore Air where Suzanne Goin cooks in-flight. Even Jimmy Kimmel bid and won, the Napa Valley package for $10,000. 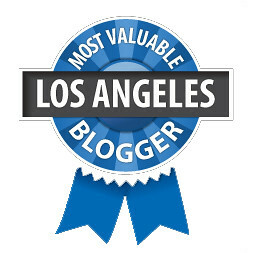 This is only the second year for L.A. Loves Alex’s Lemonade but it seems to have skipped over the growing pains which plague most new events. Only request I’d make is bring in coffee, heh. 360 video of the second tent which featured mixologists and the desserts. Pictures of everything I ate and drank at L.A. Loves Alex’s Lemonade after the jump. So bummed I missed out on that spread from Huckleberry! Were there salted caramels too? No salted camels, per se… but the ‘turtles’ were their salted camels, covered in nuts AND chocolate! Kelly, YES! Those were teh AWESOME!